Apocalyptic. There's a word that was expressly invented to describe the conditions during the afternoon's racing action of 2018 Vets Park CX. Rain. Wind. Hail. Lightning. You wouldn't send your dog out in weather like that. Yet, pedaling through that hell were seven of our AAVC juniors. Tough as nails. The seven riders of the apocalypse. Every one of them a hero. I am extremely proud of our little racers, as I am sure they are, and their parents are. Seven riders -- three of us could not start because of all the delays. If you do the math, you'll notice something: we came with 11 and we left with 12. We welcome our newest recruit, Dominic! Never raced before, shows up, and spins himself into third place as if it's easy. Well done and congratulations! First-time racer Charlie ended in fourth, second-time racer Joseph in fifth, and Gus abandoned in his second lap. They were all faster than me, though! Being out there is proof that they already are great! First four of the 9-14 junior boys: Connell, Ansel, Dominic, Charlie. The older juniors suffered, too, although they had a relatively dry race until the very end. I'm lacking podium pictures, but here we have Michael and Alex demonstrating the perils of Saturday's course. They got second and third, respectively. All told, Vets Park 2018 was epic and our juniors thoroughly enjoyed it. To prove a point, the very next day, seven riders showed up for practice. Because not even this weather is enough to scare the current crop of AAVC juniors away. The juniors this year have really come together as a team. We started out small and as the season progressed, we picked up a few more riders. We learned to race as a team. We learned to travel together as a team. Good times were had on road trips to Kalamazoo and Waterloo. 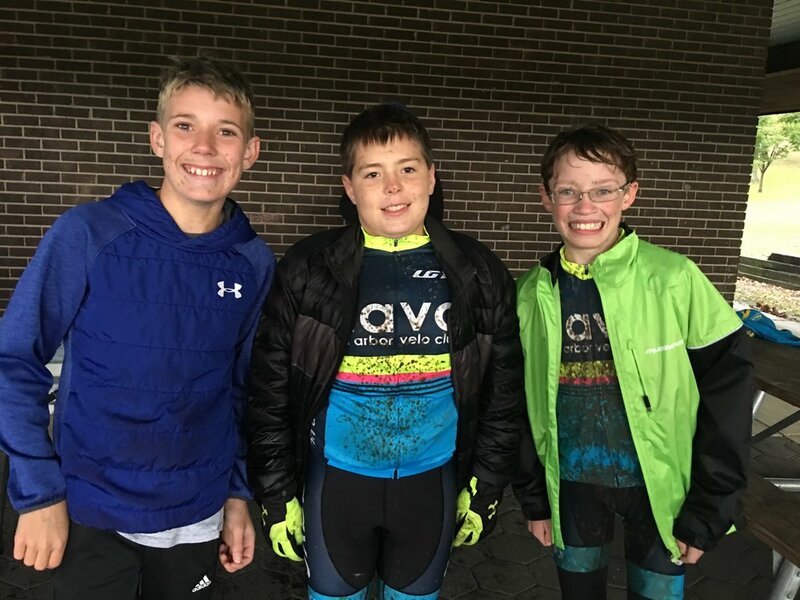 And we've learned how to be responsible citizens, too: you can always see the AAVC juniors at the end of a day of cyclocross, tearing down the course. Our mission is to expose people aged eight to eighteen to bicycle racing in the safest, most fun and most positive manner possible. 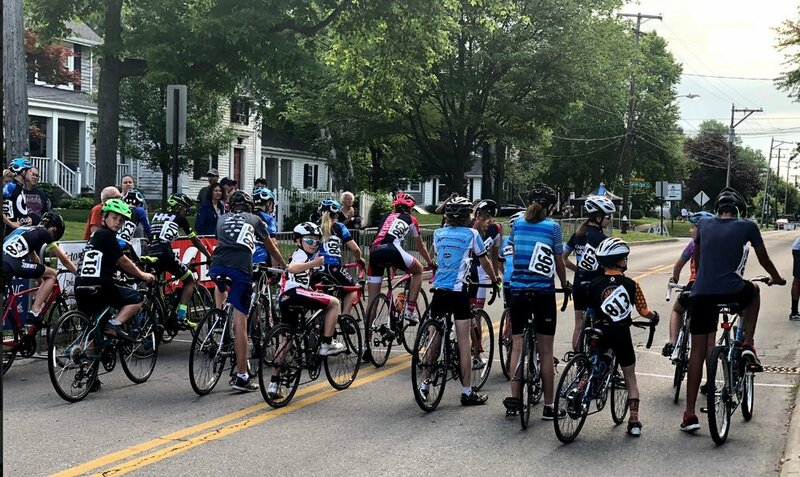 Besides teaching young riders the skills necessary to become successful bicycle racers, we also emphasize that we expect our racers to be responsible citizens. Homework, volunteering, and cycling must co-exist for AAVC Junior team members. We practice on the road, at the velodrome, and cyclocross. Our juniors race according to interest and ability. If you have children eight or older, or know of children who are interested in cycling, contact the coach and we'll find a way to add you to the team! The AAVC Women’s Team was represented by 8 racers (including Coach Kurt’s return to masters racing!) at the Detroit Cycling Championship on July 14. It was the first true criterium experience for the team, on a course with tight corners, and a large field of 24 in the Cat 3/4/5 race. The racers practiced their “clip in fast and get going strategy” from the Tuesday night crit practice lead by Eric and Josh, and were all able to start and stay with the main group. The course featured a tight S-turn that lead to some bike bumping in the first few minutes, and definitely took a few laps for everyone to get used to. Everyone had things that went well for them in the race- highlights were Lauren racing her first crit and staying on the pack longer than she expected, Ty putting in some attacks off the front, and Cameron being so close to the front she wasn’t sure what to do! It ended in a fast finish, with Kari, Christina, and Cameron coming in 7th, 8th, and 9th just behind the leaders. Ellie, Ty, and Chrissy were close behind in 17th, 18th, and 19th. Juniors: Sylvania, BTR, and Race for Wishes. Although our Junior racing team in 2018 seems to specialize in attending races with extreme weather conditions, June 9 was very much an exception. Many races before and after the juniors' races were rainy, but ours were held in perfect conditions. We had a great day, with good racing, and tons of fun on and off the course. First, Sylvania: the Sylvania Cycling Classic and the Ohio State Criterium championships for juniors. We had Aidan, Ansel, and Logan racing in the juniors; they were part of a 20-strong field of little racers. 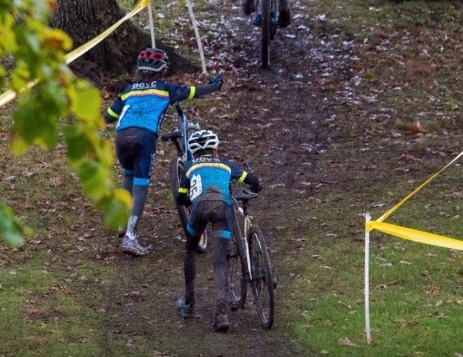 Each of our three junior racers learned a different lesson. Aidan had a very good race; after being dropped from the larger group, he methodically worked his way back. As a reward, he was still in the main group on the last lap, and able to get second place in his age group. Ansel also rode cleverly, staying in the same group and doing little work. 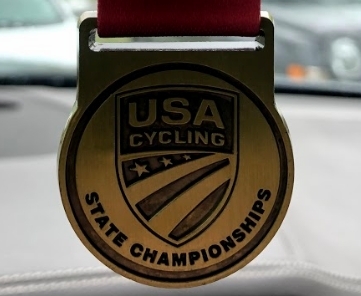 He let the older, stronger, kids do the pulls and had conserved enough energy to pull of a victory -- his first USA Cycling win. Logan, meanwhile, found himself separated from the group early on and tried to find the right pace. He was doing well, but did run out of gas a few laps before the end. Several older riders passed him, but he held on to first place in his age group. 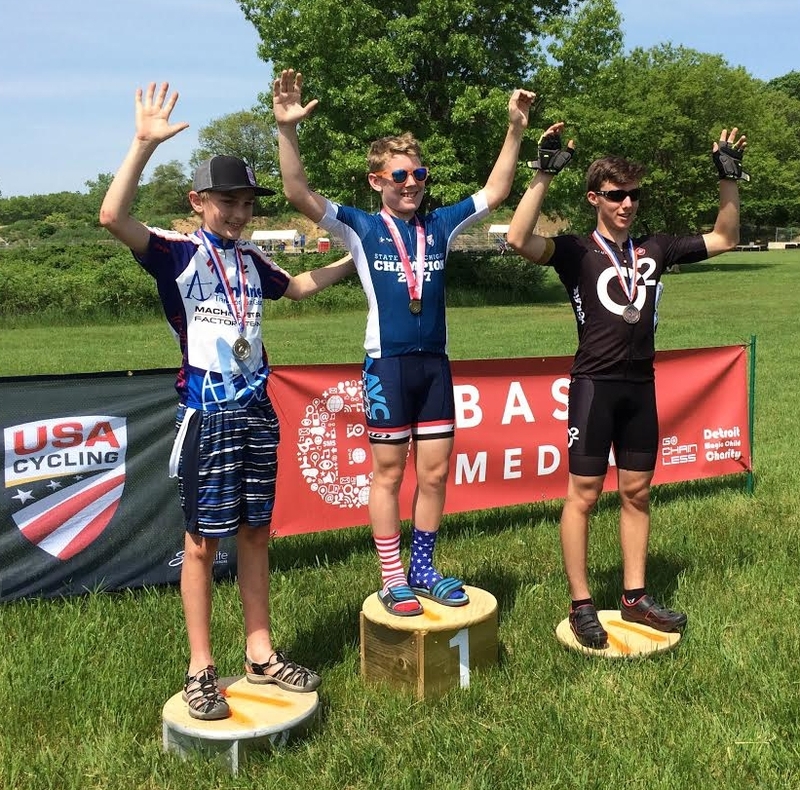 Logan's first USA Cycling win as well! Logan got to keep his medal, but Ansel and Aidan had to settle for podium places; being non-Ohio residents, they were ineligible for the State Championships medals. It still gives the AAVC plenty of bragging rights: all AAVC racers were faster than anyone from the state of Ohio! Next up was the CyclingLawyer.com criterium in BTR Park in Kalamazoo. Aidan was done for the day, but Michael was able to join us (in his own age category), and so was Connell. Michael raced first, in a very strong 15-18 field of just six starters. Predictably, the field fractured almost immediately, and Michael had to time-trial his way to a finish. And so he did, finishing fifth, behind riders who were averaging speeds over 25 mph. Speaking of high speeds: the 9-14 race was torn apart quickly when the officials decided to hand out a prime just two laps into the race. Connell took the opportunity (winning the prime) to accelerate, break up the field, and never looked back. He kept up a hammering pace throughout and took first place uncontested, lapping everyone except second and third place. Besides first place, he also took another prime. Behind him, it was every man for himself. In Ansel's case, that was worth fourth place (first among those lapped); while further back, Logan had run a very clever race. Learning from his race in Ohio earlier, he started out slower, then got stronger and picked off several racers. His final placing was fifth. At the line, he was sprinting (and beating) Henry Wert, who however was a lap down. A very honorable race for Logan who had also, unwittingly, found himself racing for a prime. He happened to lap a rider just as the official was looking for a pack of riders; the next lap, Logan had distanced himself and thus earned himself a nice bike computer! What a day. After all that racing, the AAVC racers and parents decided to enjoy the Kalamazoo brew scene with excellent food at Bell's Brewery. And then the strangest thing happened. . .
A game of Flamme Rouge broke out in the hotel! 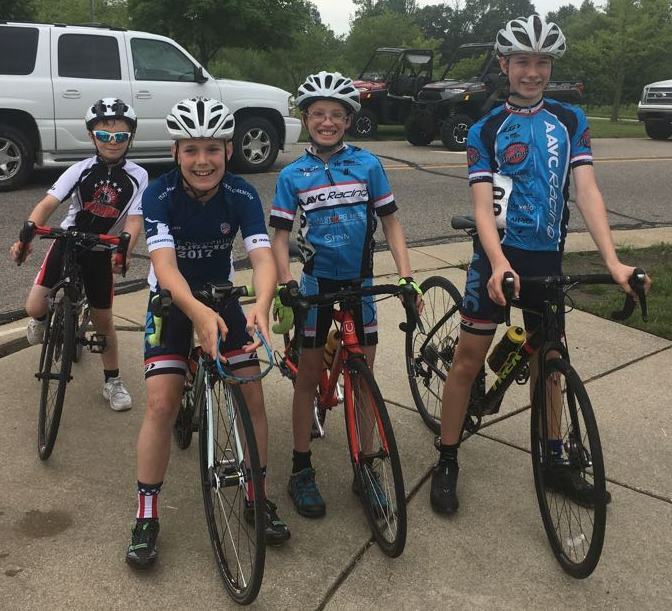 Now that is proof that the Ann Arbor Velo Club Junior Development Team is about fast fun for the family. I can't recall who won, but none of us who played it will ever forget the strange tactics that somehow gave Logan a podium place finish. Keep playing those 9's, Logan! The final race of the weekend was the 13-mile Race for Wishes in nearby Lawton. It was a completely different experience from Saturday. One, we went back to having extreme weather: a complete downpour just before the race start prompted Logan to take a DNS. He and Ansel were shivering uncontrollably and Logan took the better part of the race time just to warm up in my car. Connell and Ansel did give it a go. There were only eight racers in a field that put the 10-year-olds with the 17-year-olds. Predictably, Connell finished ahead of Ansel. Both had to work hard to grind their way to the finish. Fifth for Connell, Eighth for Ansel. And so concluded, in rather fizzling fashion, a very fun and memorable race weekend for the AAVC juniors. Sadly, it was Logan's last race with us, as he has now moved west to California. He'll still be an AAVC member and soon will race in AAVC colors. To show the other teams over there how it's done. Allez AAVC! This year’s AAVC women’s team is BIG with well over 30 women representing. Most of them have a background in running and triathlon so they are brand new to our club and want to see what the competitive side of cycling is like. The focus is on developing riders in Cat 4 and eventually Cat 3 cyclists so they can compete as a cohesive team in local and regional races. Spring arrived late this year in Michigan but as soon as the weather was reasonable the women started their weekly-organized workouts. Many of them participated in the Ann Arbor Spring Training Series and gained race knowledge and experience. The women were ready for their first official road race: Waterford Hills Circuit Race! Nine riders of the AAVC Women’s team showed up on a HOT Memorial Day to race and awesome coach Kurt managed all the logistics (tent, team jersey, cold water, trainers for warm-up… you name it!). From left to right wearing their awesome team socks: Emily, Katie, Hollie, Kari, Kurt, Christina, Maddie, Tyacie, Cameron and Chrissy. The women’s race was a combined Cat 1-5 field with a total of 13 riders. AAVC was well represented! Three fast Cat 3 women showed up from different teams. The 30-minute race started with an easier first lap, before two of the fast Cat 3 riders put in a strong attack that split the field into multiple chasing groups. Christina, Kari and Emily joined the other Cat 3 racer in the main chase group. All the AAVC women did a nice job of re-grouping once the field split and managed to work together throughout most of the race. Christina and Kari had podium finishes (3rd and 5th respectively) but most importantly, everyone had a very positive experience and there was lots of enthusiasm about racing again! Next up is BTR Park Criterium (Kalamazoo, June 9th) and Race for Wishes (Lawton, June 10th). Let’s go! After weeks of hard workouts (on the road and on the track), the 2018 AAVC Juniors were ready to race at last! Six racers showed up; from left to right: Connell (the veteran), along with first-time road racers Aidan, Michael, Lauren, Logan, and Ansel. The Waterford Hills Circuit Race was a hot affair, completely not like the Willow Time Trial. Our AAVC team was by far the largest contingent: besides our six, there were twelve non-AAVC riders; most in the 9-14 age category, which the AAVC dominated. It's hard to race cohesively in the 9-14 age bracket because the little racers have such different speed ability; but a few of the AAVC racers stayed in the pack for a good time, and there were pockets of AAVC racers behind who worked together for as long as they could. Room for progress, but also success! Well done, all. In the 9-14 category, Connell sprinted to victory (to be honest, he almost won the whole thing); Ansel converted being dropped into a fine fifth place, after rowing home with Christian who had also been dropped, and then beat him in the sprint. Behind them, Logan and Aidan finished 6th and 8th, respectively. The older junior group was decided in a sprint, Ryan beating Jackson, who slightly misjudged his sprint. Connell managed to split the two, by the way, because Connell never misjudges his sprint. Michael and Lauren (badly mangled from her high-speed velodrome crash) finished behind the pack, never quite able to connect back together. They still earned points for the club in the KOMZ Series team competition, well done! If my calculations are correct, the Juniors earned 355 KOMZ points; a sizeable contribution towards a high ranking for the AAVC overall! After the race, we had a nice barbecue. Parents brought lots of snacks and fruits to go with the meats the club provided, and we had a great time sitting in the shade with our AAVC banner. We certainly showed all the other teams how it's done. . . ALLEZ AAVC!